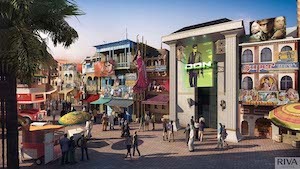 In the largest theme park destination in the Middle East, DXB Entertainments’ Motiongate, Legoland, Legoland Water Park and Bollywood, attracted nearly 1.5 million visitors in the first half of this year, the company has reported. This is an increase of 46 per cent. Of that total, 32 per cent of the visitors were on multi-park tickets, 38 per cent on single park tickets and 25 per cent on annual passes. The company said that 19 per cent of the visitors came through tour agencies and travel operators. International visitors comprised 38 per cent of the visits with most of them coming from the rest of the Middle East, the Gulf Co-operation Council countries and India. In the second quarter the group’s revenues were AED116m (€27m) of which AED80m (€19m) came through the theme parks, AED5m (€1.2m) through retail and AED17m (€4m) through hospitality. Sixty-eight per cent of revenue in the parks in the quarter was driven through admissions and 27 per cent through in-park spend.